Home > Community > Sneak Peek > Ready To Spring Into Love With Food’s April ’16 Box? 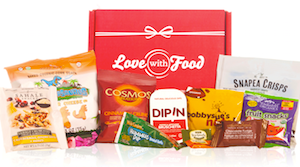 Ready To Spring Into Love With Food’s April ’16 Box? Of course you are! New season, new snacks! Love With Food experts Katie and Minnie are here to show you all what goodies await you in next month’s “Love Is Joy” April snack box. Check out the video now and get ready to get hungry! Our March Sneak Peek Winner! Congratulations to Lisa M.! Your answer about what you’d like to see in the Mystery Box was great! You’ve got a special snack box coming your way soon! Want To Be Our April Winner? Comment on the Youtube video telling us what your favorite spring activity is, and the best answer wins a snack box full of goodies! Want to get in on the April box? Sign up for Love With Food now! 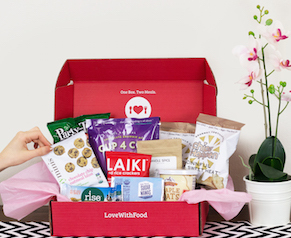 Think your friend would love a monthly box of snacks? Refer them today!